Humans are fast-paced creatures, always wanting and needing whatever they desire as quickly and efficiently as possible. This has been the way our society has existed since our inception; I want what I want, and I want it now. Jim Morrison, lead singer of The Doors, was on to something when he penned the song "When the Music's Over" off the Strange Days album: "We want the world, and we want it now." This attitude our society possesses has created multibillion-dollar individuals and corporations, has seen humans achieve the unachievable in regards to wealth and prosperity, and ultimately has created the desire for the human race to always have the newest technologies, regardless of the carbon footprint each individual leaves on our ecosystem. This is nothing new; the human race has been driven by greed and selfishness since the beginning. Your neighbors, your friends, your family all have the same wants and desires as the next person: success, money, security and to live a happy life. But as a whole unit, society has slowly started to decide the real, true purpose in life is not success, not money, not security, but environmental sustainability. Every decision each human makes in regard to our environment and ecosystem has a cause and effect. Smashing your old desktop computer into little pieces and placing it in the trash might have been a normal action in the past, but through science and investigation, we now know the ramifications these kinds of actions have on our ecosystem and the impact it has on the future of our environment. In this article, I will highlight the importance of proper e-waste disposal, the effects proper e-waste disposal has on our environment, and why environmental sustainability is essential to our survival. E-waste recycling has become one of the fastest-moving industries in the world. Our society has, for the most part, always been aware that certain convenient technologies we use every day also contain some of the most harmful known substances. Cell phones, computers, laptops, CRTs, flat screen TVs, tablets, printers, and monitors have all assisted our society in advancing our wants and needs. As we all know, technology moves faster than the speed of light, and by the time we have the newest gadgets, we are already in the process of wanting something bigger and better. As convenient as these technologies are, let's not forget that most of these gadgets contain harmful substances and should be properly recycled, refurbished, or reused. When these products are placed into landfills, either on purpose or not, we have a huge problem. Recycling electronics prevents the biggest and most prevalent pollutants in our society, which come from mining. Chemicals such as cyanide and sulfuric acid are commonly used in the mining process. When these substances spill, leak, or leach into the ground or water, the ecosystem is heavily affected. Once the chemicals are introduced to our landscape, the cycle of pollution is put into place. Through such common environmental occurrences as erosion and heavy rain, the pollutant chemicals end up in our oceans, streams, and lakes, and eventually in our drinking water. How can you help? The answer is simple: Don't be lazy and think your actions do not count. A local, state, or federal recycling program is surely closer than you think. Call your local county waste management department and find out how you can properly recycle your e-waste. Take five minutes and do some online research about how you can properly dispose of these electronics. If you think your e-waste recycling habits don't affect you, you're wrong. Do the right thing and find out your specific location for local, state, or federal e-waste disposal centers. Don't be afraid to ask your recycler's people about their specific certifications, where their e-waste ends up, and if they landfill or not. These small questions are the future of maintaining a clean, sound ecosystem. Environmental sustainability and proper e-waste recycling practices go hand in hand. Without proper recycling practices in place, our ecosystem and environment are heavily impacted. Sustainability is a common term, but when applied to the environment, it can appear to have an eerie, almost frightening effect. To sustain is to maintain or keep up. We have only one Earth, one environment, and one ecological system; the thought of not "keeping up or maintaining" could lead our society into an even more dire straits situation than we currently are in. Environmental sustainability is a key component to the ecological cycle that keeps our Earth intact. Do you remember learning about the food chain back in elementary school? Every species has a specific purpose for the planet. Large or small, they matter. Even though our society has tried to play catch-up with the ecological cycle, our past actions already may have caused devastating consequences for the human race and wildlife. In comparison to individual recycling practices, billion-dollar corporations, some of whom make major decisions for our ecosystem and have large political influence, are charged for polluting our water systems and land. Most get a fine and/or possible incarceration. These decisions are based on what I spoke about earlier: greed and laziness. Do your own, personal part in making proper decisions about recycling e-waste. 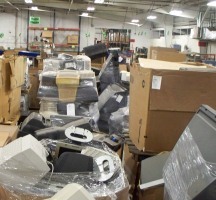 Hold corporations and businesses responsible for their irresponsible e-waste recycling practices. Don't be afraid to call someone out or voice your opinion about how important our planet is and what it means to you. Knowing and understanding that each individual is personally responsible for the future of our environmental sustainability is possibly the most important detail for our survival. In conclusion, if each individual does not do his or her due diligence in properly recycling e-waste and any other recyclable item, the future and our environment will be at risk. We might not experience this in our lifetime, but to certain individuals, it's already here. It is time for everyone in our beautiful world to step up and take responsibility for their actions. Be a leader and not a follower. Take the time to properly dispose of your electronics, and make the phone calls that give you the needed information on how to follow ethical practices. The majority of e-waste recyclers hold the necessary certifications needed to properly dispose of electronics, so do your research and find one that works best for you. Make yourself a part of this important e-waste recycling community and do the right thing. because these small steps can make or break our environment. Patrick Ferry is a sales executive at Dynamic Recycling of La Crosse, Wis.
Patrick Ferry is a sales executive at Dynamic Recycling, a full-service, R2/ISO-14001 certified computer and electronics recycling company located in La Crosse, Wis. It offers electronics (E-waste) recycling, asset management, and scrap material purchasing services to customers across the United States. The company's focus on Environmental Responsibility, Customer Service, and Affordability is what sets it apart from other computer and electronics recycling companies.